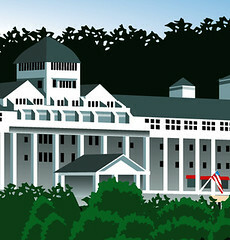 Here's a vector illustration of the Grand Hotel on Mackinac Island. It was created for a web site. Placing the windows and pillars took forever to get "just right". Creating the angular shadows was a lot of fun to do because it gave the illustration some depth. holy snap brother .. this is tight. did the grande old girl some justice to say the very least .. when'd you get vector on me?